The thriving AI ecosystem in Toronto can serve as a model for other tech hubs. The system is underpinned by the region’s AI talent and expertise, by increasing support from venture capitalists for startups, and by leadership from the top. Canadian Prime Minister Pierre Trudeau is into coding, welcomes entrepreneurs to Canada, has tuned the immigration system to help attract experts and has backed the effort with government grants. Toronto is home to world-class academic institutions including the nearby University of Waterloo and the University of Toronto. “These institutions are world leaders in scientific research, creating an ecosystem ripe with opportunities for novel applications for AI, particularly in the fields of heal and life sciences,” stated Naheed Kurji, president and CEO of Cyclica, writing in VentureBeat. Cyclica offers an AI platform for use in the pharmaceuticals industry. Toronto is welcoming, with a diverse, international and well-educated population. A strong local network of investors, incubators, technologists and support staff is sustaining and growing AI companies focused on transforming specific industries, Kurji stated. Organizations headed by AI pioneers are leading and advising startups in the Toronto region. These include: Geoffrey Hinton, called by some the “Godfather of Deep Learning,” who splits his time between Google and teaching at the University of Toronto; Sanja Fidler, assistant professor of computer science at the University of Toronto, and a director of AI at NVIDIA; Raquel Urtasun of the University of Toronto and the head of Uber Advanced Technology Group in Toronto. Urtasun started at Uber in May 2017, to pursue her work on machine perception for self-driving cars. The work entails machine learning, computer vision, robotics and remote sensing. Before coming to the university, Urtasun worked at the Toyota Technological Institute at Chicago. 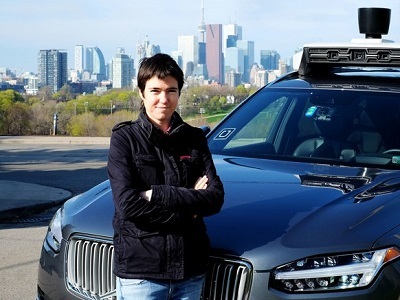 Uber committed to hiring dozens of research and made a multi-year, multi-million dollar commitment to Toronto’s Vector Institute, which Urtasun co-founded. She still works one day per week at the University of Toronto. Urtasan has argued that self-driving vehicles need to wean themselves off LIDAR (Light Detection and Ranging), a remote sensing method that uses a pulsed laser to measure variable distances. Her research has shown in some cases that vehicles can obtain similar 3D data about the world from ordinary cameras, which are much less expensive than LIDAR units, which costs thousands of dollars. The Vector Institute is one of a group of business-growth focused institutions that call Toronto home, the others being the MaRS Discovery District and the Creative Destruction Lab. Each shares a commitment to advancing AI innovation in the city. Each organization is connected to academic programs, cultivating local technology talent. All three bring technical and business talent together to optimize innovations and position them for the market. The Vector Institute is an independent, non-profit research institution focused on deep learning and machine learning. Its global partners include Google, Shopify, Accenture, Thomson Reuters, NVIDIA, Uber, Air Canada and five major Canadian banks. Its chief scientific advisor is Hinton, who has said, “The Institute will build on Canada’s pool of globally recognized AI expertise by training, attracting and retaining more top researchers who want to lead the world in machine learning and deep learning research.” This while having the flexibility to work on commercial applications within companies or in their own startups. 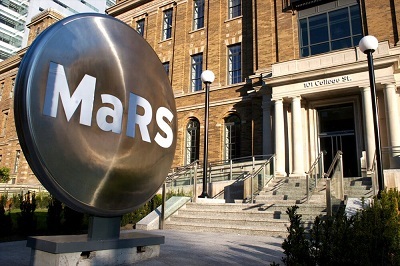 The MaRS Discovery District is a non-profit, public-private partnership founded in 2000, originally to commercialize publicly-funded medical research. The original name stood for “Medical and Related Sciences,” but that narrower association was later abandoned to include information and communications technology, engineering and social innovation. As of 2016, startup companies emerging from MaRS had created more than 6,000 jobs and raised over $3.5 billion in capital (2008 to 2016) and generated $1.8 billion in revenue (2008 to 2016). The Creative Destruction Lab at the University of Toronto’s Rotman School of Management is a seed-stage program focusing on the transition from pre-seed to seed-stage funding. One of the lab’s co-founders is Dennis Bennie, an entrepreneur who co-founded the software company Delrina Corp., sold to Symantec in 1995 for shares valued at $760 million. He has since founded the XDL Venture Fund, focused on early stage opportunities. The book is a guide for companies for how to set strategies, for governments to design policies and for people to plan their lives for a different world that AI will bring. The three prominent economists recast the rise of AI as a drop in the cost of prediction. The authors show how basic tools from economics provide clarity about the AI revolution and a basis for action by CEOs, managers, policy makers, investors and entrepreneurs. Toronto continues to attract significant interest from the investment community. Toronto saw a 165% increase in funding with $321 million invested across 38 deals in Q1 2018, according to a report from PwC Canada and CB Insights. Toronto accounted for 34% of $1.7 billion in VC funding invested in Canada in 2016, according to Fintech Finance. Active technology startups in the Toronto region number between 2,500 and 4,100, according to Tech Toronto, an organization that supports and monitors the community. As more Canadian companies have proven to be successful, interest from VCs has increased, according to Chris Erickson, general partner of Pangaea Ventures of Vancouver. “More VCs have been getting good returns, raising more money and investing it in Canadian companies. We’d like to see that improve and grow,” he stated in a recent account in Crunchbase News. The Canadian Venture Capital and Private Equity Association (CVCA) reports that in the first half of 2017, Canada saw 21 exits compared with 32 in all of 2016. This included two venture-backed initial public offerings: Ontario’s Real Matters, Inc., in financial services; and Zymeworks, Inc., a biotech firm. Toronto saw a 165% increase in funding with $321 million invested across 38 deals in Q1 2018, according to a report from PwC Canada and CB Insights. Toronto is also attractive to foreign tech companies. Paytm, a leading fintech startup from India, last year chose to develop its lab in Toronto for the close links between the financial and technology sectors, and the available talent pool. PayCommerce, a fintech firm from New Jersey specializing in cross-border payments, chose to launch an R&D operation in Mississauga. WeWork, a coworking space provider based in New York City, last year rented 60,000 square feet of office space in downtown Toronto to capitalize on the entrepreneurial energy. Major technology firms that have chosen to locate their Canadian headquarters in the Toronto region include: IBM Canada, Markham; Alphabet (Google), Toronto; HP Canada, Mississauga; Cisco Systems Canada, Toronto; and Microsoft Canada, Mississauga. In addition, GM Canada recently announced plans to open a 15,000 square foot technical center in Markham to conduct R&D on autonomous cars, with the potential to create some 700 high-quality jobs. The government of Ontario, as part of a national “super cluster” initiative, will invest $80 million in the Autonomous Vehicle Innovation Network, in partnership with the Ontario Centers for Excellence, a public-private accelerator. The Ontario government plans to expand its Business Growth Initiative to $650 million over five years, targeted towards helping innovation-driven small and medium enterprises grow and compete internationally. More recent announcements about setting up AI labs in Toronto have come from Adobe, Samsung, LG Electronics and Etsy. Vivek Goel, VP of research and innovation with the University of Toronto, was quoted in the Globe and Mail as saying companies are moving core development operations to the region to take advantage of local talent. “From my perspective, it’s very positive. It’s creating opportunities for our folks to develop careers in Canada, where traditionally these individuals maybe have gone abroad,” she stated. Deep Genomics is using AI to focus on early-stage development of drugs for inherited diseases that result from a single genetic mutation, diseases estimated to affect 350 million people worldwide. The company has raised $16.7 million to date and has hired a team of geneticists, molecular biologists and chemists working on treating disease using biologically-accurate AI technology. Deep Genomics was founded by Brendan Frey, a professor at the University of Toronto who specializes in machine learning and genomic medicine. The current work is driven by cost-effective new ways of sequencing whole genomes, the entire readout of a person’s DNA. “There’s an opening of a new era of data-rich, information-based medicine,” stated Frey in an article in MIT Technology Review published in May 2017. “There’s a lot of different kinds of data you can obtain. And the best technology we have for dealing with large amounts of data is machine learning and artificial intelligence,” he stated. The startup, which employed 17 people, Jacobs stated was guided by a desire to help “build a global AI ecosystem in Canada.” In addition to heading Layer 6 AI, Jacobs is now the Chief AI Officer, Business and Strategy, for TD Bank Group. Trained as a lawyer, Jordan spent 15 years advising tech entrepreneurs, Grammy and Oscar winners and sports teams in complex transactions and financings. Winterlight Labs monitors cognitive health by speech sample analysis. The company has raised $1.5 million total from investors. The firm’s AI technology is said to quickly and accurately quantify speech and language patterns to help detect and monitor cognitive and mental diseases. Its diagnostic system aims to analyze natural speech to detect and monitor dementia, Alzheimer’s, aphasia and other cognitive conditions. The scalable platform uses short recorded speech samples to analyze hundreds of linguistic cues, detecting dementia and other conditions with a high level of accuracy. The platform has applications in drug trials, long-term and primary care, and speech language pathology. Co-founder Frank Rudzicz called these verbal clues “jitters” and “shimmers” – high frequency wavelets only computers can year, in a recent interview with Wired. Winterlight positions its tool as more sensitive than pencil and paper-based tests doctors currently use to assess Alzheimer’s. Winterlight’s tool can also be used multiple times per week, instead of once every six months like the pape method. That lets it track good days and bad days in measuring a patient’s cognitive function. The product is still in its beta test stage, and is being piloted by medical professionals in Canada, the US and France. Watch this space for more on AI innovation in Canada.